It is a pity to observe (from the programme notes) that the Medieval Ensemble of London only lasted a few years as from the evidence provided here they sure were an excellent group of singers. The music is by John Bedyngham (d. 1460), John Dunstable (c. 1390-1453), Hert and Walter Frye (fl. 15th century), all composers who were pretty much well known in their lifetime and who provide works that are interesting and quite varied. The Davies' brothers are excellent exponents of the music here and with their able team of soloists, this CD is extremely enjoyable and also very beautiful. 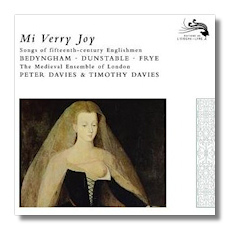 I was particularly taken in by Patrizia Kwella's singing in the title track, "Mi Verry Joy" by Bedyngham and the contributions of Roger Covey-Crump in such pieces as "Le serviteur" (Bedyngham), "Je languis" (Dunstable) and last but not least "So ys emprentid" by Walter Frye. The other soloists also accredit themselves well and Timothy Davies' lute is a soothing accompaniment in several of the pieces. The 1983 recording – which also features Margaret Philpot, Michael George and, Paul Hillier – has come up fresh and clean as a whistle and enshrines this trailblazing period vocal performance for posterity. Lovers of early Medieval vocal music and the sense of mystery it creates should not hesitate to acquire this splendid re-issue.